Every town has its tales—ghost stories that send chills down your spine and make goose bumps spring up on your skin. This Mischief Night, Laurel Hill Cemetery is host to the region’s classic ghost tales and creepy legends. Featuring The Not Ready for After-Life players as storytellers of these otherworldly tales, tours will depart every half hour through the stones and mausoleums of Laurel Hill. By candlelight, firelight, and lantern, storytellers will regale you with tales sure to set your bones shivering. Afterwards, slow your slow heart rate with hot cider and cookies. Enjoy an appropriately Victorian macabre introduction by Sussurus Din, author of Gloomy Presentiments of Things to Come and You Think Us Mad, Don’t You?. Bring your own flashlights. 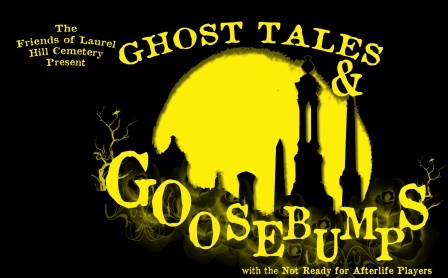 One evening of Ghost Tales and Goosebumps is scheduled at Laurel Hill: Thursday, October 30 at 7:00pm. Tours will depart every half-hour, with the final tour departing at 9:30pm. The cost for Ghost Tales and Goosebumps is $20/person general admission. Advance reservations are requested for groups. Tickets can be purchased at the door, by phone (215) 228-8200, or online.